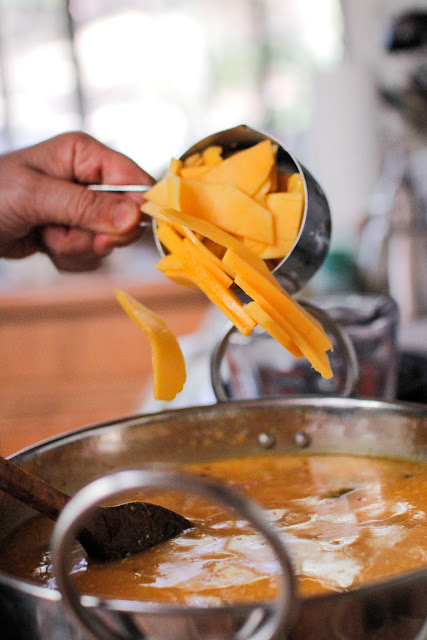 One of the things I always seem to be looking for when cooking Indian food is the elusive perfectly ripe mango. They can be tricky to locate at certain times of the year. I'm always fondling the mango looking for the perfect combo of tender but not squishy. After years of doing this, I figure I have a pretty good hand and am extremely popular at the mango bin. So much for ripe mangoes. But all cooking doesn't involve ripe mangoes. Sometimes you want the unripe. You want the green mango. The Green Mango may sound like some kind of divey bar on Cahuenga Boulevard, but actually it's a staple of the Indian kitchen. Mangoes are full of good stuff, among them vitamin C, Vitamin A, beta carotene, I could go on.. but check this out and you'll see. Green mangoes have all that and a bit more. Being unripe they're chock full of anti-oxoidents and very alkaline, but in a good for you way. Green mangos are also a hell of a lot easier to find than the ripe ones. Trust me on that one. So when you go to the market craving a nice mango and they're all hard as rocks, don't go away empty handed. Check out this simple fish curry with green mango. together in a blender or food processor until you have a smooth paste. Set the coconut paste aside. Heat 2 Tbs of oil in a skillet or kadhai. When the oil is hot, add in the 1/2 cup of sliced shallots and fry them until they're lightly browned. Add in the fenugreek seeds, and curry leaves or bay leaf and stir them around for about 1minute. Fry it until the oil seeps to the top and the mixture is cooked. 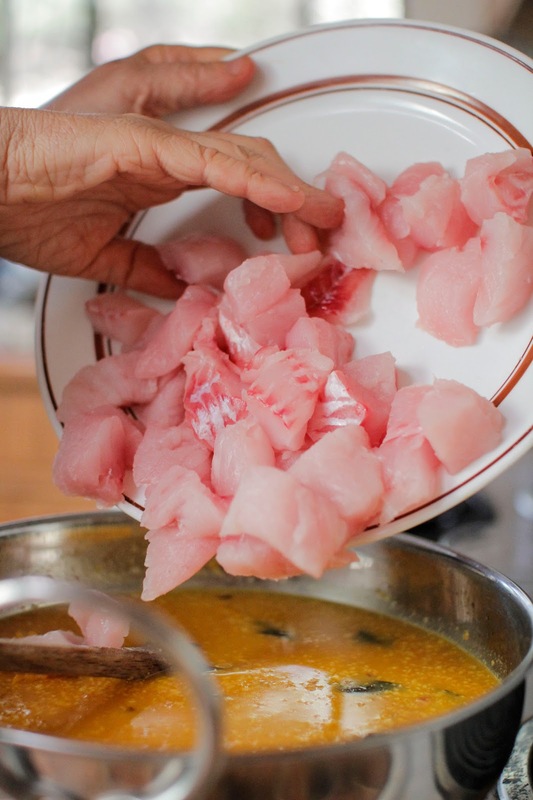 Simmer everything together over a low heat until the fish is cooked through. Pour into bowls and serve. This recipe serves 2. 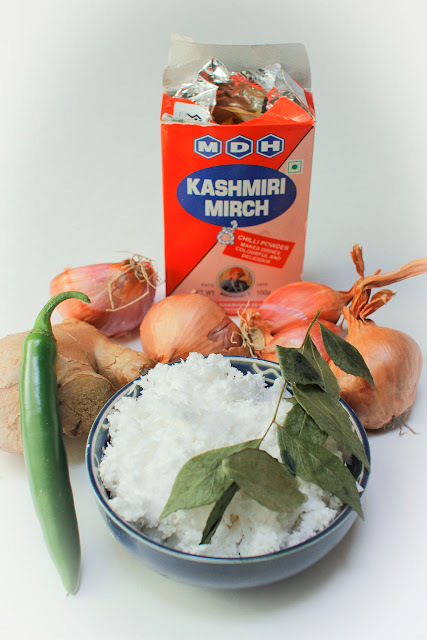 This soupy curry is perfect served with rice and a vegetable side. I served it with Eggplant Thoran. 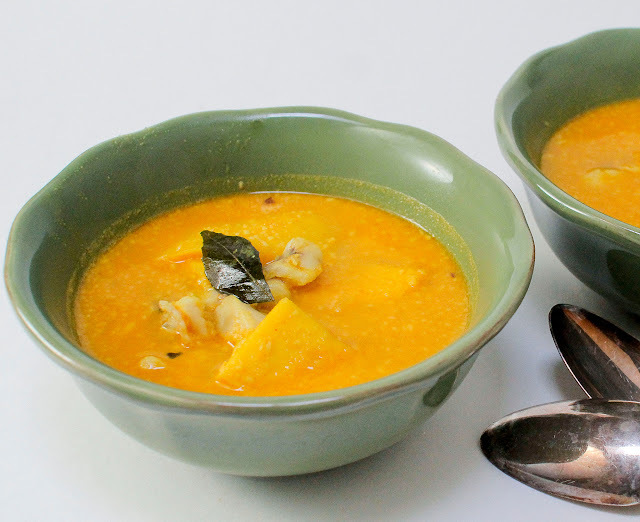 What I love about this dish from Kerala is it's a perfect meal for the cooler fall weather, a variation on the usual fish stews and chowders that are usually served, plus it looks like Halloween with all that great mango beta carotene! If your'e using bay leaf instead of curry leaves remember, always remove bay leaves before serving. Another great thing, this dish makes up super fast which is a big deal for me lately with all the family stuff that needs tending to. My mother has moved on from toaster ovens to microwaves and I'm bringing one over this afternoon that I hope she can operate. I have turned into a small appliance chauffeur. looks nice! but I have to say the green mango in India is really green; I mean my takes a cleaver to it and chops it like wood. And they are like undersized and a very pale yellow/white inside. So next time you see one hard, pebble-sized speciman, grab and use it. Yes... I've nott seen those but I'll keep an eye out. Usually what comemy way are the huge Alphonso mangoes. I am going to do your version as well, because those are types of green mangoes I can get hold of as well. I love this! 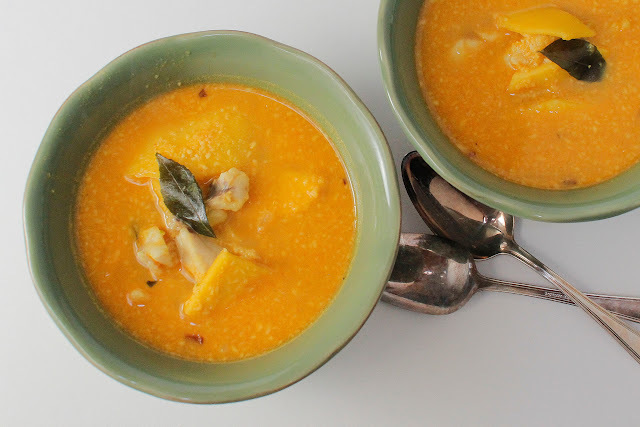 I'm always looking for new ways to use fish, and the color of this curry is gorgeous! This is my first visit to you blog..The fish with green mangoes is one of my favorite dishes. I literally drool thinking about it. Your love for Indian food amazes me. It am so glad i found you blog. thanks so much! I've been cooking Indian gfood for nearly 23 yrs and yes, I do love it! Off to visit your blog!